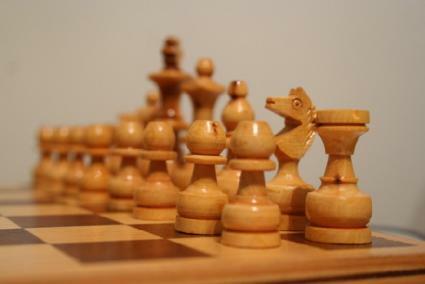 There are many opening chess tricks that you can try to outwit your opponents in the early stages of the game. While you won't be able to take these tricks to tournament play or play them against a stronger player, you could probably whip these moves by a new player or your sister. This article assumes you know the basic moves of chess and can read notation. If you need move help, try reading this article on the basic moves. To learn how to read notation, go to Avler Chess. Fool's Mate is a quick game (as well as the oldest quick mate) where Black mates in only two moves. The moves are 1. F3 E5 2. G4 Qh4#. White plays "foolishly", not playing the basic principles of opening play. Scholar's Mate takes two more moves, but gives white a chance to have a quick checkmate. Follow along with 1. E4 E5 2. Qh5 Nc6 3. Bc4 Nf6 4. Qxf7#. What happened to Black? He wasn't paying attention to White's queen being moved out early and so far away. Make sure you watch the attacks from the Queen so early in the game. If you think you're opponent doesn't have a plan, then things like the Scholar's Mate will happen to you. The GIGO Gambit (garbage in/garbage out) was introduced in the magazine Chess Life in the early 90's. The gambit was played by a computer that eventually won the game, but only because of a human opponent that didn't grasp what was going on. The moves are 1. G4 D5 2. Bg2 Bxg4 3. C4. From here it looks like white is just being silly. But 3. …Pxc4 will get you 4. Bxb7. If you don't want to resign from embarrassment, all you can do is 4. …Nd7 5. Bxa8 Qxa8 to be down only a pawn but without your rook. Everything is all out of whack for Black and must come back from a weak position. This works simply because Black got greedy with White's pawns. A gambit sacrifices for a reason: to get a better position or set an opponent up for an attack. The following opening chess trick doesn't have a name, but involves a daring Queen sacrifice. Follow along: 1. e4 e5, 2. Nf3 d6, 3. Bc4 Bg4, 4. Nc3 g6?, 5. Nxd5! BxQ, 6. Bxf7 Ke7, 7. Ne5#. The game starts out normal, going from the French Defense into a little Ruy Lopez, but when Black moves 4. …g6, probably to bring out the Bishop because it's trapped by the d-pawn, White goes to work by moving his Knight out to sacrifice the Queen. Of course Black falls for it because it is a Queen after all! The game starts out with the basic moves of The Caro Kann: 1. e4 c6, 2. d4 d5, 3. Nc3 dxe5, 4. Nxe5 Nd7. The next move, 5. Qe2 can be very deceptive if you are Black and are moving your pieces into position. Most people will get that d7 Knight out of that row and move it to 5. …B6, which can then let white do 6. Nf6#. This is one of those traps that follow the opening moves, but then White throws in a variation that Black may not realize since the Queen is hidden behind the Knight. The moral to this story is Watch out for discovery attacks! White usually has the upper hand in a number of opening chess tricks, but if you are looking to change the tables, then look no further than the Traxler Counter Attack. This variation stems from the Two Knights Defence and at one point looks like Black could have a downfall. 1. e4 e5, 2. Nf3 Nc6, 3. Bc4 Nf6 4. Ng5 Bc5 are the opening moves. Black, with his last move doesn't care that his f7 is under attack because after 5. Nxf7 Bxf2! ?, 6. KxB Nxe4+, Black will save his Queen to h4 or f6 and threaten mate and/or a superior attack. Remembering the above opening chess tricks as well as regular opening strategies can assure you that you can put away a chess match quickly if you are paying attention to the mistakes of your opponents, if they make any.